Matt has been innkeeping at Seven Sea Street Inn since 1987, when the inn was designed and newly built by the Parker family, to replicate an early Nantucket post and beam colonial home and to function as a thoughtfully considered bed and breakfast. The inn is the fulfillment of a childhood dream for Matt, who loves innkeeping and hospitality and the opportunity of meeting new and interesting people from across the United States and around the world. An “army brat,” Matt was born in Germany and raised in Rhode Island, while his father served in the army corps of engineers. As a boy, he first came to Nantucket in 1969 visiting friends with his family. Nantucket made such an impression on him that he vowed, along with his sister, to not take the Nantucket rope bracelets off their wrists until they could return to the Island. The plan worked, they returned the next year and this began his love for the Island, which eventually merged with his passion for Innkeeping … he thinks it’s more of a calling. 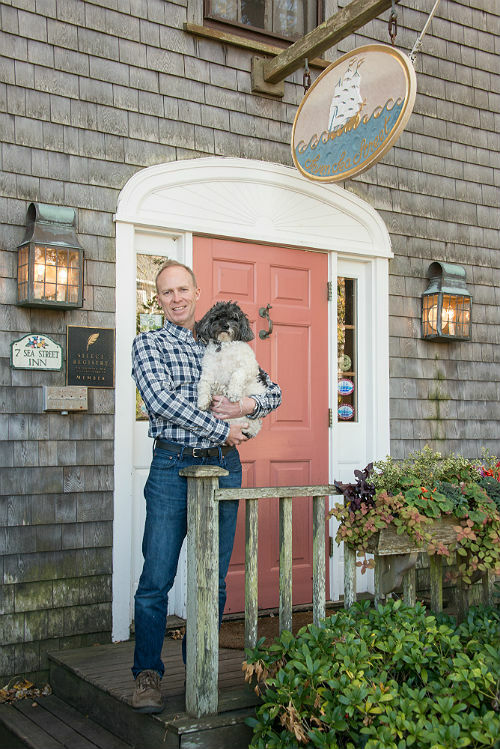 Matt has served as chairman of the Nantucket Lodging Association, has been on the board of directors of the Chamber of Commerce, and has served as a member of the Nantucket Visitor Services committee. When not at the inn, he’s a single dad raising his three boys or planning his next active vacation adventure. He has recently become a running enthusiast, participating in area running events and especially enjoys bike tours from around the world with Backroads. Recent bike trips have taken him to Sonoma/Napa, Bryce/Zion, Catalonia Spain, Mallorca and Tuscany. Claudia Formoe has been the resident Innkeeper since 2009 and adds a wonderful dimension of hospitality and welcoming at the Inn. She has traveled the world and is conversant on almost any topic … usually with a funny anecdote to share. Her baking skills are world renowned and she’ll share that with you over breakfast as well! Please allow us the opportunity to share with you the beauty, the history and the magic of Nantucket, as our guests.